Fan mail #1: This message is from an 18-year-old girl who says that, rather than perfume, they prefer the smell of detergent on freshly washed clothes. She asks what smells our hosts like. Kame: I’m sorry, but I don’t care. I just don’t care. Gaki-san: (laughs) Don’t be so cold. To answer the listener’s question, though, Kame suggests blinking a lot while applying the eye drops. Gaki-san asks if this wouldn’t in fact only lessen the chances of the eye drops actually getting to where they’re supposed to, but Kame explains she does so simply because she’s scared of them dropping directly into her eyes. For people like that, though, Gaki-san recommends simply rolling your eyes back so you can’t actually see the drops falling in. Kame: In any case, I have a couple of questions for this listener. Like… Okay, little kids can’t apply eye drops properly. If the listener is in fact a little kid, I can forgive them for this mail. Gaki-san: And if they aren’t a little kid? Gaki-san: If they did that, they’d be the same as you. Fan mail #3: Morning Musume will be going to the Japan Expo 2010 in France soon, and the listener wishes to know what the hosts would like to do while they’re there. Eating? Shopping? Art appreciation? The thing with France is that it just seems like a big movie set — like everyone must be munching on some baguette as they walk around — so the hosts are worried whether or not they’ll be able to blend into that sort of a scenery. “I mean, just imagine Kame walking around with a baguette in hand. 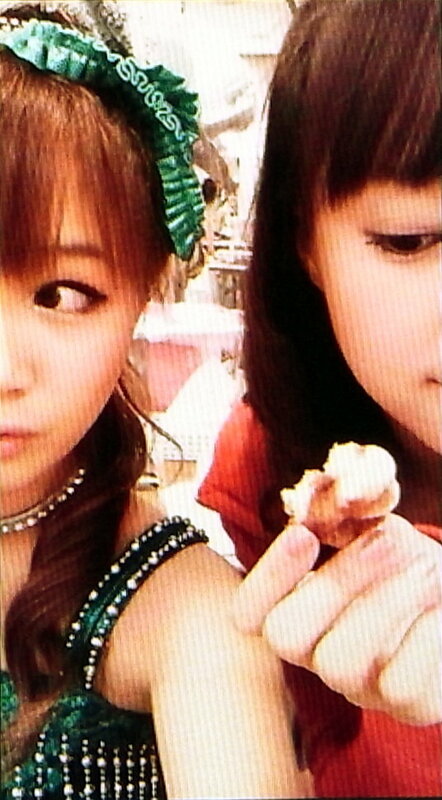 People would be pointing and laughing!,” Gaki-san thinks. Ultimately, though, the hosts think it’s probably the concert they’re most looking forward to. Just like how it happened with their concert in Los Angeles, the two are sure it will feel significantly different than the group’s concerts in Japan. Gaki-san: And speaking of France: “Tomo,” the coupling song of our upcoming single “Seishun Collection” will be the theme song of Japan Expo! Gaki-san: (laughs) You knew about this already! Kame: Wait, wait, wait! Really?! Could you please repeat that?! Gaki-san: No. I already mentioned this on last week’s episode. Kame: Oh, right. My bad. Fan mail #5: The listener wishes to know what the hosts are the most mindful of when they’re doing their make-up. Gaki-san enjoys doing make-up — not just hers, but also for her little sister or her mom. One pointer she gives is to try and pick the right shade of eye shadow for you, as this can vary from person to person. On a more general note, she recommends trying to get at least the eyes and the eyebrows right. Gaki-san: We’re waiting for your messages! Go ahead and ask us anything, such as “if Kame isn’t Fashionable, then what-nable is she? ” Anything goes!